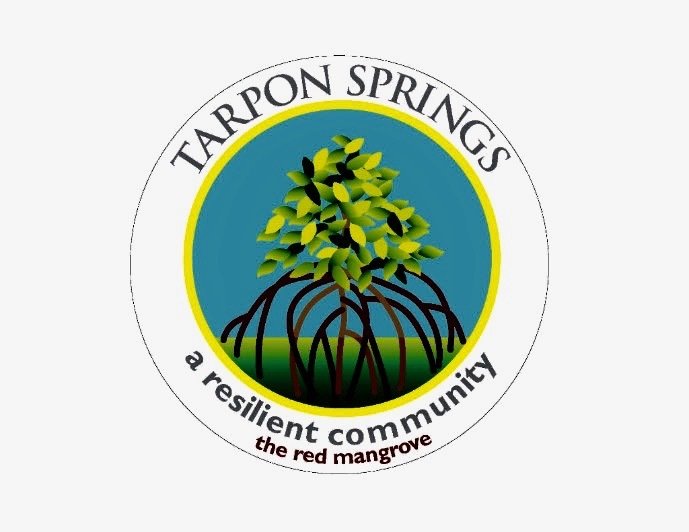 For the past three months, I’ve been driving through various parts of Florida witnessing events and gatherings of communities committed to creating safe, loving, trauma informed, and trauma healing spaces. Sunday March 10th, I was in Sarasota at the invitation of Dr. Andy Blanch. Andy and a group of her colleagues invited people from the community to explore ways to make Sarasota a trauma informed community. Over 120 people gathered at Sarasota’s Selby library to engage in conversation, learn more about the connection between adversity and health and social outcomes, as well as to brainstorm ideas on how making this understanding the foundation of their actions could move them toward becoming a healthier, stronger and more equitable community.. Sitting next to me at the event was Helen Neal-Ali, the author of O.K. Forever: A Book of Hope. I have since read this powerful memoir that details her life and experiences as a victim and survivor of domestic violence. 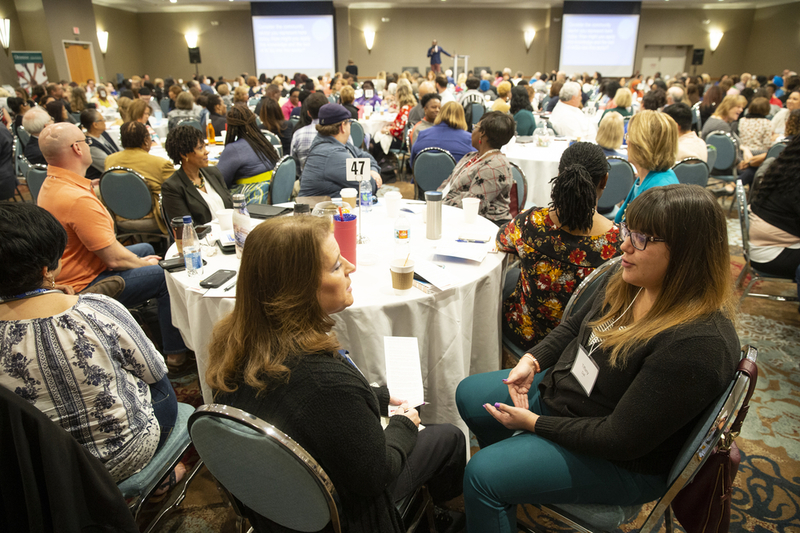 On Wednesday April 3rd, I found myself in Central Florida with a standing-room-only crowd of over 550 attendees listening to Dr. Vincent Felitti deliver a morning keynote address detailing the findings of the CDC-Kaiser Permanente Adverse Childhood Experiences Study (ACE Study). The event was titled “Creating a Resilient Community: From Trauma to Healing.” It was spearheaded by Rachel Allen, director of the Peace and Justice Institute and presented by the Peace and Justice Institute of Valencia College, the Early Learning Coalition of Orange County, and the Florida Department of Health Orange County. My colleague and friend, Carey Sipp, the Southeastern Regional Community Facilitator for ACEs Connection, was responsible for my attendance. She shared a photo I sent her of the attendees raising yellow “Visions & Commitments” cards. In the afternoon conference participants were given an opportunity to talk with their table partners and as a result of that conversation identify an action that they were personally willing to take to address adverse experiences in our communities. (see https://www.acesconnection.com...st-annual-conference). But…what about those people who are not in the room? Those people who are never at the table? Those people who for various reasons are unable to attend these gatherings or conferences? Who don’t even have the money to pay for a bus pass let alone the conference fee? Those people who don’t feel like they matter, who can’t sense that they have worth and value? What about those people who feel they are cut off from themselves and others because they are experiencing the staggering effects of trauma in nearly every aspect of their lives? Who don’t have access to the tools, practices, or skills to deal with their trauma? What about them? Since May of 2018, Tommy Loper, an Aspen colleague and managing director of The Resnick Aspen Action Forum, has been working on a project named Weave: The Social Fabric Project with David Brooks, author and columnist for the New York Times. This project started with the idea that social fragmentation—isolation, alienation, and division—is the central problem of our time. As I understand it through the experiences that Loper, Brooks and all those involved with Weave the Social Fabric Project have had they’ve come to see that programs don’t turn around lives. What turns lives around are relationships. What Weave the Social Fabric Project has recognized is good news! Now that there is greater understanding about trauma, an appetite exists to deal with it in new ways, and everyone is part of this progress. A healing of hearts is happening in individuals, in the hearts of communities, and in all societies on Earth. Each person is unique and every situation is different, yet healing begins with the transformation of relationships. The difficult work of rigorous “truth-telling” is required—done with diplomacy and love—as well as an ethic that respects the dignity of each soul, each human spirit. The management of inner experiences in the midst of conflict, and the understanding of how everyone is capable of causing harm and experiencing it (this understanding comes about through the sharing of personal story with one or more compassionate witnesses) is what leads to humanity’s ability to create a better existence. Laurie, a clinical director at a behavioral health center, attended the monthly gathering. She participated in a five-minute “enlightened witness” exercise I led. The exercise requires working with a partner to maintain direct eye contact without speaking. Laurie told me that the person she was paired with was uncomfortable, and it made her aware of how who she is and how she shows up played a part in the experience. The therapist part of Laurie was trained to help people, but this exercise brought her insight as to how others may experience her “help.” Being good at counseling requires the ability to see everything that is going on with the other person, even when there are thoughts and emotions that are difficult to see. Laurie shared that when she was in graduate school she had to pick an area of concentration for study. She was given the choices of family work, substance abuse counseling, or vocational rehabilitation. She didn’t want to do substance abuse work because it was an issue in her family and her own judgments about it made her avoid the choice. Laurie’s point was that you don’t have to be a therapist to be therapeutic; you just need to meet people wherever they are in their lives or emotional situations, and be willing to offer your witness, compassion, and ability to listen. You, and most everyone else, have been taught that life is safer, that you are safer, when you look away. She punched him in the face then pulled out the scissors and stabbed him. She hit him again with her fist, stabbed him again, and hit him again until his friends pulled her away. Things did not immediately change for Helen. In order to flee that abusive relationship, she moved to another state only return a year later when her father was diagnosed with bone marrow cancer and would have his leg amputated. Helen made the choice to move back and live with her parents. A bit later, Helen met and married her second husband, a follower of Christ, who gave Helen her first child, a son. The pregnancy was the beginning of Helen’s sobriety, but it also marked the end of her second marriage. With the idea that it takes three strikes to be counted out, she married a third time and had her second son with a man who abused her emotionally. Helen suffered a nervous breakdown. Yolanda has been on a path of healing for most of her life. She grew up in a family who's spiritual practice included the belief that the body was created to heal itself. Yolanda retired from a 30-year career in community and public health in 2004, during which, her focus was prevention, treatment and recovery. Yolanda was introduced to ACEs during her time in Public Health. The yellow card she raised stated her intention to continue using ACEs awareness in conjunction with her awareness of the traumas of racism, sexism, poverty and oppression which were not traumas included in the original study. Yolanda told me that being introduced to the work of Bryan Stevenson and his concept of healing through "Truth and Reconciliation", has shaped her work and use of ACEs. Bryan Stevenson is a lawyer, and is the founder and executive director of the Equal Justice Initiative in Montgomery, Alabama. Last year, Yolanda attended the opening of EJI's National Memorial for Peace and Justice, and The Legacy Museum: From Enslavement to Mass Incarceration, an experience that introduced her to the work of the Peace and Justice Institute of Valencia College. Yolanda is a Black woman, with ancestors who were enslaved Africans. Every generation of her family has worked and served and fought for and contributed to the building of this country, including its wealth, power and global positioning. A country that after several generations, became their home. An experienced she shares with millions of other descendants, who love this country, that does not love them back. Despite all of this, Yolanda holds hopes, as a global citizen, that every person, every living thing on Earth, will be given and have the same opportunity to thrive and obtain what they need to live their best life. She hopes that someday everyone will come to a place where they wish the best for everyone else. By sharing the stories Laurie, Helen, and Yolanda told me, I want to demonstrate that every single person has something to give to another, that anyone can be an enlightened witness for another person, that every individual has the ability to give a sense of worth and value to someone in need. The intentions written on the yellow cards that were raised in Orlando each have the power to change lives. Trauma information is good. The ACE Study was of tremendous value to the human race. But beyond those tools, humans needs to learn to love and accept others with an open heart, to forgive when necessary, and to practice mercy and compassion. Doing those things is what being “trauma informed” is about at its core. This is where the science can be supported by spirituality. Many, if not all people, have suffered at least one Adverse Childhood Experience. The science-based tools and practices for healing are great, but what is needed most for healing is the witness and compassion of another person who practices love, honor, compassion, and who demonstrates the discernment to know where and when boundaries must be created and respected. One caring person can change a life for the better, for it is in relationship when such change can happen. The act of being a witness, and showing compassion, allows you to engage in healing yourself and others. Once you understand this, it becomes who you are, and it starts showing up in our shared culture. Many people in our society are now trauma informed. 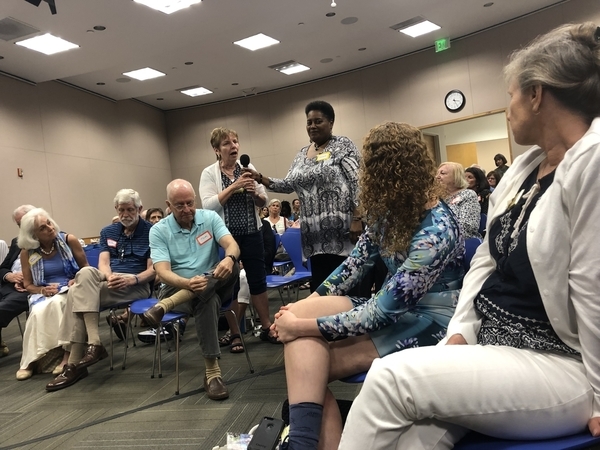 The focus now should be to allow others to put what they know—as demonstrated on the yellow cards filled out by the participants of “Creating a Resilient Community: From Trauma to Healing” in Central Florida—into action. Thank you Jane and Carey! The generosity of heart, generosity of spirit, and generosity of love that you model are a blessing to me. You make me strive to be a better man and a more generous soul. Grateful for you in my life. Blessings and love to you. Thank you, James, for this wonderful overview of some of the fantastic work to build ACEs communities in Florida! We are building resilience, creating and furthering the relationships that make this amazing work so attractive to more and more community leaders. The Movement is expanding rapidly, and with depth and strength, thanks to visionary leaders such as yourself. Please keep adding to your ACEs Florida Tour Travelogue! Our U.S. and international communities will be inspired by your work, and you may well inspire others to report in with a state — or nation — ACEs Tour of their own! We would so welcome the reports!